MythBusters! Are Calories Eaten at Night More Fattening? One of the common questions dietitians get is, “When is the best time to eat?” Often followed by, “What are some healthy nighttime snacks?” A few years ago Sargent Choice Nutrition Center alum Elizabeth Jarrard, now a registered dietitian, answered these questions in a great blog post. Reading through it, I felt it had to be reposted for anyone who might have missed it. Enjoy! Just make sure you reach for the right thing when you give a nighttime craving! We like the rule of 3s for a satisfying snack! Step 1: Pick a whole grain for energy you need right now. Step 2: Pick a non-starchy vegetable or fruit for filling power. Step 3: Chose a lean protein to make it last. Chips n Dip! Whole corn tortilla chips, baby carrots and salsa for a mini Mexican fiesta! Cereal’s good at any time: Sargent Choice granola, Cheerios, Wheaties, Shredded Wheat or Life with berries in 1% or skim milk. If you’re bored with milk swap it with non-fat Greek yogurt to give it a protein boost! Make me a sandwich! 100% whole grain breads with lettuce, tomato, with sliced turkey breast or other lean deli meat. Also try it with a tortilla or whole wheat pita! 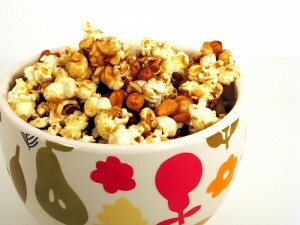 Just pretend you’re at the movies: Pair Popcorn with an apple, or pear, and nuts. Our Intern Brianna Wilson made this Trail Mix Popcorn which is a big hit! Preheat oven to 250 degrees F. Combine popcorn, nuts, and dried fruit in a large bowl. Mix remaining ingredients in a small bowl. Drizzle butter mixture over popcorn mixture and toss to coat. Spread popcorn mixture onto baking sheet and bake for 30 minutes, stirring every 10 minutes. Enjoy! We’re here to squash those night-time munchies because no on likes to go to bed hungry!! 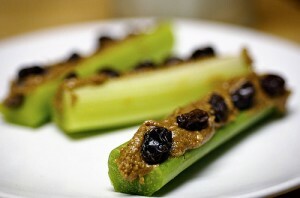 What are some of your favorite healthy snacks? Do you get crave a bedtime snack?